In our quest to find the perfect cinnamon rolls we had to take a few important details into consideration. First, the finished dough had to be soft, light and doughy not dry and airy. Second, the filling had to be gooey and buttery. It had to have just the right amount of cinnamon to sugar ratio to create that bubbling sea of caramel like confection. Last of all the frosting could not be too sugary, lemony or taste like cream cheese. We wanted the perfect balance of flavors encompassed in a pillowy soft blanket. It has taken me two years to narrow down the list of contenders. From my final list of three I forgot which of the top two contenders was the one we liked best. Fortunately for us we had family in town to help devour the re-test. Our favorite recipe for cinnamon rolls is actually a combination of the two. Tips: For best results use a 9X13 baking dish. We found that when the rolls were baked on a baking sheet they came out dry and thin. Dissolve sugar in water. Add yeast. Let proof (yeast will bubble up), about 5 mins. In a bowl combine the warm milk, eggs, butter and salt. Add flour, one cup at a time stirring until well blended. Knead dough for 10 minutes until smooth. Place dough in a bowl, cover w/ a damp cloth. Let rise in a warm place for about an hour until doubled in size. Punch dough down. Knead a few times. Roll dough into a 16×21 inch rectangle. 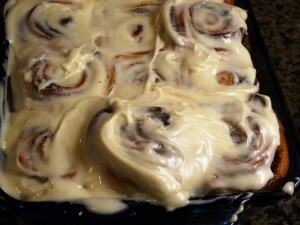 Spread dough with 1/3 cup softened butter and sprinkle evenly with sugar/cinnamon mixture. Roll up dough and cut into 20 (1 1/2-inch) rolls or 12 larger rolls. Place rolls in a lightly greased 9×13 inch baking pan. Cover and let rise until nearly doubled, about 30 minutes. Meanwhile, preheat oven to 400 degrees F (200 degrees C). While rolls are baking, beat together cream cheese, 1/4 cup butter, confectioners’ sugar, vanilla extract and salt. Spoon frosting on warm rolls before serving. A couple Friday’s ago Stephen brought home a pumpkin muffin with strussel topping. I was gracious for his thoughtfulness. Now, normally a pumpkin muffin would have sounded appetizing but I just was not that interested. You see last year I went pumpkin crazy. I finally found the much sought after Pumpkin Chip Cookie recipe. Then I went in search for the best Pumpkin Bread recipe. Along the way I found a couple recipes for Pumpkin Pound Cake. Then there was the traditional Pumpkin Roll and Pumpkin Pie on Thanksgiving in addition to a scrumptious Pumpkin Ice Cream Pie. I cannot forget the Pumpkin Whoopie Cookies and pumpkin pie bars, so divine. Lastly, this past spring I found an wonderful recipe for Pumpkin Apple Muffins. I suppose this is why I have been focusing so much on apples this fall. Still, this recipe for Pumpkin Pistachio Cannoli has been nagging at me. 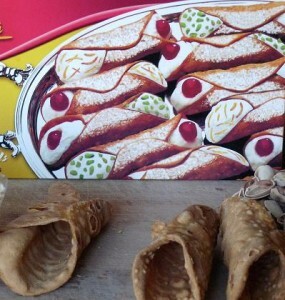 “Please make me!” Cannoli shells can be found in the bakery section of the market . The recipe states that tortillas may be substituted. Tortillas are surprisingly versatile. Mascarpone cheese is a thick spreadable cheese similar to cream cheese. It comes in a small tub usually found in the deli with the gourmet cheese. 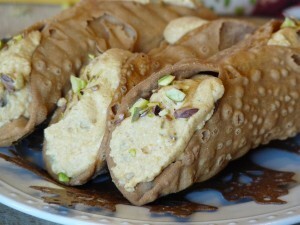 So grab the kids and get messy making Pumpkin Pistachio Cannoli. In a large bowl stir together Mascarpone cheese, powdered sugar, pumpkin, ricotta, and pumpkin pie spice until smooth. Stir in 1/4 cup of the nuts. Set aside. In a chilled mixing bowl beat cream with an electric mixer until stiff peaks form. Fold into pumpkin mixture. If desired, cover and chill up to 4 hours To serve, spoon pumpkin mixture into a self-sealing plastic bag. Snip a 3/4-inch hole in one corner. Pipe filling into cannoli shells so pumpkin filling extends from ends. Sprinkle cannoli ends with remaining nuts. Arrange on a serving platter; sprinkle with sugar. Makes 12 servings. *Note: If purchased cannoli shells are not available, brush one side of sixteen 4-inch flour tortillas (trim larger tortillas if necessary) with cooking oil. 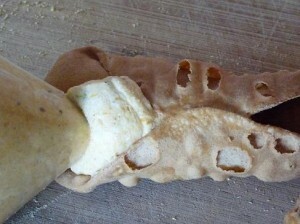 Roll, forming a tube shape; secure with a wooden toothpick. Gently place a rolled piece of foil in the center for support. Place on a baking sheet; brush outside with oil and bake in a 375 degree F oven about 15 minutes or until golden brown. Place on a wire rack to cool. Remove foil and toothpicks; fill with pumpkin mixture. Makes 16 shells (allows for breakage). This is an old recipe I collected while in Texas. I became friends with a family come to find out one evening that the woman’s (the girl I got the recipe from) husband knew my brother. They met years earlier in Southern California. I can’t remember how the conversation turned to my brother but I remember thinking, what a small world. Peanut butter pie is to be eaten among friends because you do not want any left overs. Mix ingredients only until smooth (not like a shake). Press into graham cracker crust. Freeze. Top with melted chocolate, hot fudge or chopped Reeses Peanut Butter cups. Serve.